It also provides exceptional high temperature stability and oxidation resistance. SAE Viscosity: 75W90. While topping up the oil at that frequency may be annoying and possibly expensive, there is generally nothing to worry about. This is to ensure our prices remain as competitive as possible. While topping up the oil at that frequency may be annoying and possibly expensive, there is generally nothing to worry about. SAE Viscosity: 90W. Application: Diff / Axle Oils. This is to ensure our prices remain as competitive as possible. While topping up the oil at that frequency may be annoying and possibly expensive, there is generally nothing to worry about. It is approved for use where Ford WSS-M2C200-D2 is specified. Quantity: 2 Litres. SAE Viscosity: 75W. This is to ensure our prices remain as competitive as possible. Type: Fully Synthetic. 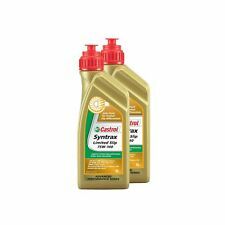 Full synthetic oils last longer than semi-synthetics or mineral oils, so although they may cost more in the first place, a full synthetic can work out as a cheaper option in the long run. Straight high quality oil for most types of gears, including helical, spur, bevel and worm. LAND ROVER. SAE Viscosity: 75W140. Quantity: 3 Litres. This is to ensure our prices remain as competitive as possible. Application: Diff / Axle Oils. Type: Race / Competition Synthetic. Certain engines suffer from fuel dilution (fuel mixing with the oil) and that is one of the quickest ways that an oil can breakdown. SAE Viscosity: 80W90. This is to ensure our prices remain as competitive as possible. While topping up the oil at that frequency may be annoying and possibly expensive, there is generally nothing to worry about. JAGUAR XE XF XK XJ F-TYPE CASTROL BOT 750B DIFFERENTIAL OIL LTR - C2P25272. Genuine Jaguar Castrol BOT 750B differential oil. Suitable for the models listedbelow. XK (06-14) 5.0 Ltr - from C/N V000001. F-Type (2014 on) 2 Ltr Ingenium Petrol. NEW XF (2016 on) Front Differential AWD - from C/N GCY00001. Castrol Hipress EP140 contains anti-oxidant and anti-foam additives to protect against oxidation, tooth corrosion and oil foam problems. Quantity: 3 Litres. This is to ensure our prices remain as competitive as possible. DEX III AUTOMATIC TRANSMISSION FLUID. Safety data sheet available on request. Contains sensitizing substances. May produce an allergic reaction. Always read the label and product information before use. Model: 1848060. Item model number: 1848060. DEX III AUTOMATIC TRANSMISSION FLUID. Manufacturer Part Number: 15003D. OEM Part Number: 154EE9. Product Details. Land Rover Part No -TYK500010. Range Rover Sport 2005>. Range Rover 2002>. Discovery 3 2005-2009. It is approved for use where Ford WSS-M2C200-D2 is specified. SAE Viscosity: 75W. This is to ensure our prices remain as competitive as possible. While topping up the oil at that frequency may be annoying and possibly expensive, there is generally nothing to worry about. Quantity: 3 Litres. This is to ensure our prices remain as competitive as possible. SAE Viscosity: 90W. Type: Race / Competition Synthetic. Application: Gear Oils. In the vast majority of cases, there is no need to flush the engine and flushing can be harmful. It is approved for use where Ford WSS-M2C200-D2 is specified. Quantity: 3 Litres. SAE Viscosity: 75W. This is to ensure our prices remain as competitive as possible. Type: Fully Synthetic. Full synthetic oils last longer than semi-synthetics or mineral oils, so although they may cost more in the first place, a full synthetic can work out as a cheaper option in the long run. Castrol B 373 is a specially prepared gear oil based on mineral oil for high performance and racing cars of all categories. 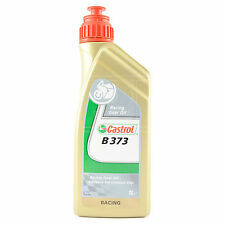 Castrol B 373 should not be mixed with conventional gear oils, otherwise loses its excellent properties. Castrol Classics from Opie OilsCastrol D140 gear oil is monograde 'straight' high quality oil for most types of gears, including helical, spur, bevel and worm. Castrol D140 is a heavier gear oil as normally required by non-hypoid final drive gears. SAE Viscosity: 80W. This is to ensure our prices remain as competitive as possible. While topping up the oil at that frequency may be annoying and possibly expensive, there is generally nothing to worry about. Smooth shift at low temperature ZF TE-ML 11 / API GL4 Castrol Syntrans B 75W is a fully synthetic fluid approved against ZF TE-ML 11 for in-line manual gearboxes used in BMW passenger cars. Syntrans B 75W provides excellent gear and bearing protection critical for in-line transmission performance, exceptional cold performance, giving smoother gearshift at cold temperatures. Syntrans transaxle. Castrol Syntrans Transaxle 75W-90. Transmission oil Castrol. Marke Castrol. 20 liters of oil. Run the oil change yourself from, you often have the opportunityat local recycling collection points (recycling) to make your used oil (possibly for a fee). Syntrans Multivehicle. 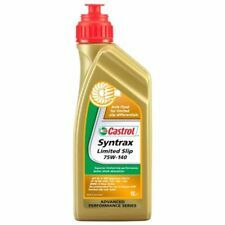 Castrol Syntrans Multivehicle 75W-90. Transmission oil Castrol. Marke Castrol. 20 liters of oil. Run the oil change yourself from, you often have the opportunityat local recycling collection points (recycling) to make your used oil (possibly for a fee). SAE Viscosity: 75W90. multigrade formulations within this range, e.g. 75W/90, 80W/90 and 85W/90 and can replace the following conventional Castrol gear oils Castrol EP 90. Castrol EP 80. Castrol EPX 80W/90. Castrol ST90 is fortified with anti-oxidant and anti-wear additives to ensure that the oil is able to withstand the oxidising conditions which will be present in the gearbox during service. Castrol ST90 is not suitable for applications where MIL-L-2105A/B/C are specified. SAE Viscosity: 75W140. This is to ensure our prices remain as competitive as possible. While topping up the oil at that frequency may be annoying and possibly expensive, there is generally nothing to worry about. Improved Transmission Cleanliness and Resistance to Thickening. Type: Mineral. In the vast majority of cases, there is no need to flush the engine and flushing can be harmful. What can happen is the flush can loosen harmless deposits in the engine, but then not remove them. Also suitable for non-limited slip where a GL-5 SAE 90 is required. Quantity: 3 Litres. This is to ensure our prices remain as competitive as possible. Application: Diff / Axle Oils. All cheaper oils and the 'synthetic' component of part-synthetic or semi-synthetic oils are hydrocracked mineral oils. Approved for use in ZF manual transmissions. While topping up the oil at that frequency may be annoying and possibly expensive, there is generally nothing to worry about. This is to ensure our prices remain as competitive as possible. SAE Viscosity: 75W140. While topping up the oil at that frequency may be annoying and possibly expensive, there is generally nothing to worry about. This is to ensure our prices remain as competitive as possible. Also suitable for non-limited slip where a GL-5 SAE 90 is required. While topping up the oil at that frequency may be annoying and possibly expensive, there is generally nothing to worry about. This is to ensure our prices remain as competitive as possible. SAE Viscosity: 75W90. While topping up the oil at that frequency may be annoying and possibly expensive, there is generally nothing to worry about. This is to ensure our prices remain as competitive as possible.